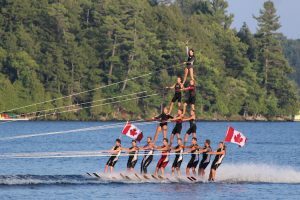 Summer Water Sports has been performing waterski shows since the 70’s, and they keep the family cottage tradition going every summer. The shows are packed with entertainment for all ages. Come watch members of the Canadian National Ski Show Team and Team SWS as they thrill audiences with death defying stunts, grace, beauty, technical sophistication and, of course, comedy for the kids. All shows are open to the general public.